Debuting a few years after the start of the new millennium, the first-generation Mitsubishi Outlander was a late arrival to the small-SUV segment. Like many of its peers, it had a car-based design that translated into good handling and a comfortable ride on paved roads, but limited off-road capability. 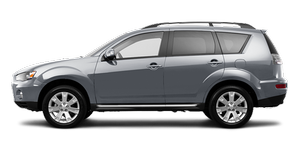 With so many competitors, Mitsubishi tried to set the Outlander apart with distinctive styling and a sporty demeanor.